I’m teetering in that awful mid-project spot, peeps. I’ve hit a few snags—pattern match? Fail! Where’d all that ease come from?—it’s hard to imagine it being awesome when it’s done. The promise of the pattern illustration has faded, and the reality isn’t winning me over yet. Yeah, that pattern. That promise. Usually, I rely on momentum to get me through this phase (and really, while not all projects have it, it’s pretty common). But I’ve been sewing at the pace of a snail lately, what with constantly running into “I could sew but I need THAT”, with THAT being everything from piping (no, Tanit, one package is never enough) to lining to that pattern piece I had last week, dammit. And with the whining out of the way—fitting photos! Because that makes everything better!?! So, re fit—the left-hand side under the arm is the opening and I did a piss-poor job of pinning it shut, so focus on the right for the fit. Aside from the complete pattern-match fail at back and the fact that it’s way more high-cut than the picture seems to suggest (and no, I did not do any preemptive petiting here), what do we see?. The biggest thing that’s annoying me is that blousing in the back. I don’t get along well with blousing. I can certainly take it in, either at the CB seam or the sides. The waist seems a bit long at the sides, not so much at the CF. Maybe shorten all around the waist except at the CF? The hip yoke seems really short, too. I’m pretty sure I’m going to have to re-cut the skirt pieces as I think I cut them WAY short (since I was expecting the yoke to come down to, oh around my hip crease….) That might be a good thing, though, as I can try again with the plaid-matching. There’s lots of material left, fortunately. 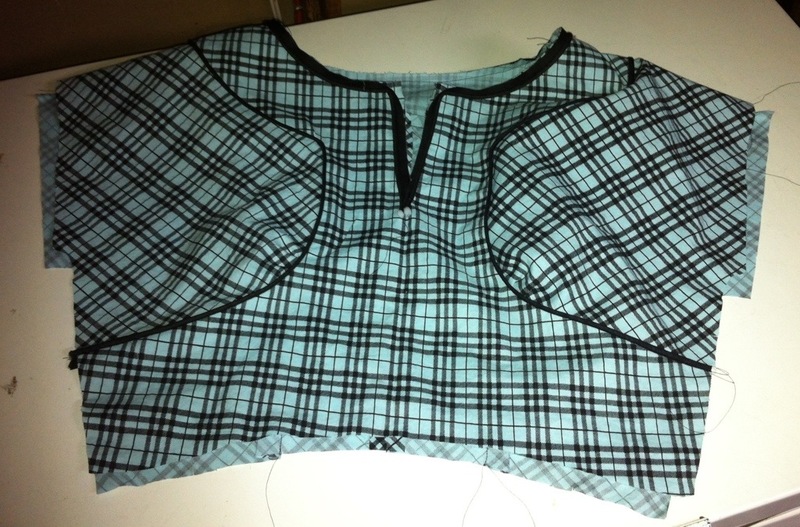 I was planning to not pipe the waist seam (I prefer not to emphasize my waist) but to pipe the bottom of the yoke. The fact that Osiris got Skyrim for Christmas might just have a little bit to do with my slow going. * I’m a sucker for an open-world Fantasy RPG, even if it does have a few too many load screens… and while the thrill of discovering even more mysterious zombie-filled ruins may not outweigh the thrill of a new dress, when it’s accompanied by hunny-cuddles and laziness, well, I’m distractable, especially when the dress is being problematic. *Seriously, I am the Ultimate Gamer Girlfriend(TM). Not only do I like the videogames… I like watching him play them! Yeah, I know, embarrassing. Isis, you are a Goddess, worshipped as the ideal mother and wife as well as the patroness of nature and magic- the friend of slaves, sinners, artisans, and the downtrodden. You listen to the prayers of the wealthy, maidens, aristocrats, and rulers. You are married to the King, you have children. YOU ARE BUSY. You deserve downtime of any sort that pleases you. You may whine to your adoring minions as you see fit. No one will notice pattern matching, blousing etc. due to the extreme blinding aura surrounding you. Sometimes you just need a good whine. It usually calls for a little wine! I call the down times losing my sew-jo. I fall out of love with my fabric or pattern. I try to remember how great a finished project feels. Maybe throw in a mini-project so I get that completed feeling again. Feel free to whine anytime! Oh, I know the whiny feeling. I’ve had a sewing disaster today, and I literally cried. Some more video games sounds like a good solution to me! Personally, I’m going for wine and DVDs, and maybe hopping back on that sewing horse tomorrow. I am just glad we are all human and everyone has a whine sometime but I don’t think yours was really very whiney. Good work! It’s something in the air – I did the whiniest post ever yesterday too, and that was after my mood had already been much improved by your sound advice on the fit of my Briar t-shirt (thank you!) Bring on spring, basically. It’s ok to whine sometimes, we all do and we understand ! Plus you saved it all by showing what a GGG wife you are, watching Osiris play!!!! Yeah, I’m at at mid-project slump too with M5661 – and also trying to resist the urge to start something new! So I shall be watching these comments with interest. 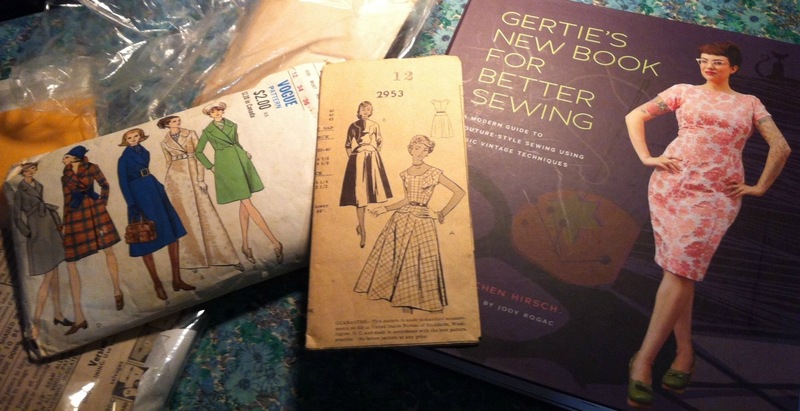 I’m so glad to see you sewing something for yourself! Piping has near-magical properties, doesn’t it? PS – I am such a great sports girlfriend that I once beat out 113 other people in a football pool as a side effect of sports watching cuddle time. So, I hear ya on this one! I totally also love watching video games, and if that’s what you want to do, then do it. The dress will still be there when you get done. I just sewed a big meh, so I can sympathize! I tried it on halfway through for Mr. Cation and he and I were both so unenthused it was difficult to finish. The only thing that kept me going was that I couldn’t start on my next project until that one was out of the way. Also, I love watching someone else playing Skyrim too!! That was last summer for us, and boy is it fun! Totally agree with you about those load screens, though. If only we could all have Lydias follow us around doing things for us so that we could sew properly! I hate it when project starts out working, but then mid-way through becomes a jumble. It takes the steam out of your desire to finish! The piping does look fantastic! What about if you put a dart in the back to take in some of the “poufing”? Good Luck with it! I have to admit that getting an Xbox and Skyrim for Christmas 2011 took a fair chunk of time out of my sewing 2012, and not because I was being supportive girlfriend (for my boyfriend couldn’t care less about video games) but because I, myself, get totally sucked into open world RPGs. So, for your sake and mine, I’m going to say that it’s ok to let yourself get distracted sometimes! Well, The record for losing momentum on a project is about 2 years in my sewing corner/dungeon, and having the games in the same room is VERY distracting. *shrug* But both are fun! Love that piping – it’ll come along on it’s own time. I’m glad to see you sewing for yourself again! Pls! That’s not whiny. That’s just “real”. I have my very own whinefest tag, which I use quite often, so no judgement here. Besides, I think we can all relate to how it feels when something doesn’t quite measure up to the awesomeness on the pattern envelope. My attempts to play the original “Pong” were a big fail, in the 1970s. I never picked up another video game after that. It has remained a foreign language to me, one I never intend to decipher. Y’all seem to have fun with them, though. 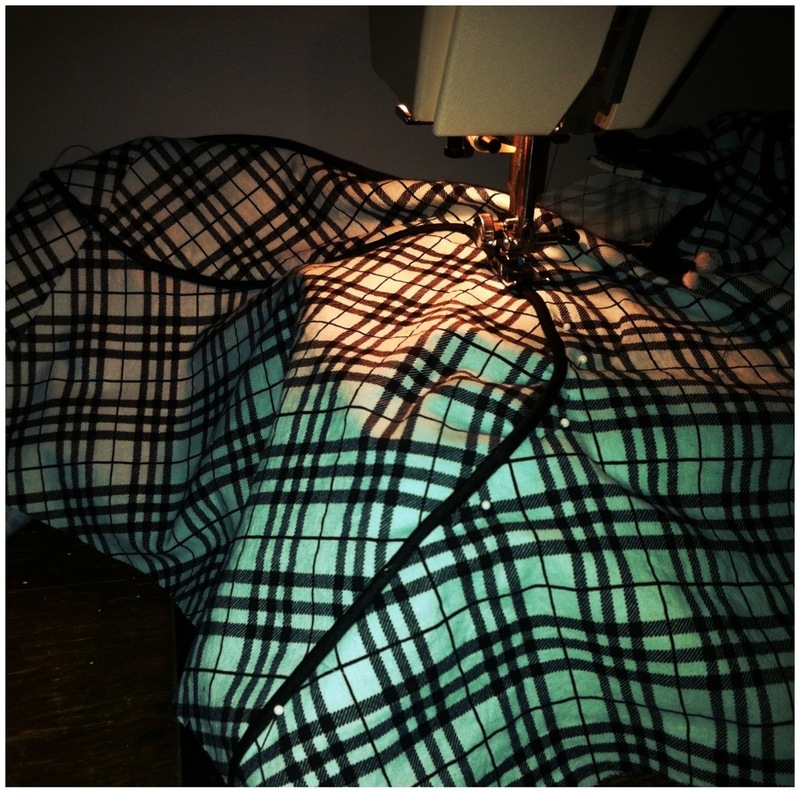 My solution to sewing problems is to start sewing on another sewing project, lol. As for lapped seams, I hate and despise them, and will do almost anything to avoid them, including setting in complicated curves and/or multiple corners. The many seams on this dress should offer you lots of places to alter for a proper fit. Using piping (and its kinder cousin, folded bias without stuffing) is an excellent way to disguise a less-than-perfect pattern match. Although, anyone who takes the trouble to point out your less-than-perfection in public deserves to be hit with some powerful sort of magical weapon and instantly reduced to ashes, no? I got to the end of this and then had to re read to try and detect this mythical whine of which you speak. Nope, still don’t hear it. Sounds like an honest telling of a bunch of frustrations to me. I wish I had a nifty trick for getting over the slump but really, all I can think of is that you should follow your desires and do what you like. It’s a hobby afterall! Not an obligation. If snuggles with husband watching him game is where it’s at, then enjoy it. Also, watching video games is awesome! A whine once in a while is ok 🙂 I’m whinging about Ceylon at the moment, have sewn so many wrong pieces together, and overlocked, before realising it all has to come apart – again!! Good luck!! Go whine away. Its cathartic and necessary and we all totally understand. Its your blog!! I hate that slump in the middle of a project too, though my projects are way less complicated than yours. My avoidance is blog reading. Gardening. Cooking. Anything but housework.